The Speak feature was incorporated into Microsoft Office back in version 2003. Can PowerPoint speak aloud & read the text in my slideshows? Change the Speak preferences in the Windows Control Panel. Can Microsoft Word read to me? Yes, it can. The Speak feature was incorporated into Microsoft Office (Word, Outlook, PowerPoint, etc.) back in version 2003. It was called Text to Speech (TTS) then, and it functioned much the same as it does now. Fortunately, it’s a very simple procedure to set up and use, so you can get started immediately. 1. Click the Customize arrow on the Quick Access Toolbar. 2. From the dropdown menu, select More Commands. 3. On the Word Options screen >Customize the Quick Access Toolbar, locate the Choose Commands From box and scroll down to the Speak command. 4. Select the Speak command, click the Add button in the middle of the screen, then click OK.
5. Word adds the Speak command to the Quick Access Toolbar at the end, and you’re ready to go. 1. Ensure that your system’s speakers or sound devices are turned on. 2. Highlight a paragraph of text, then click the Speak command button. 3. Word reads any text that’s highlighted, even the entire document. Press Ctrl+ A to select the entire document. 4. Click the Speak command button once to begin the reading session, then click it again to stop. There is no pause-and-continue option at this time, but many users have requested this feature, so look for it in future versions. 1. Another way to have your text read aloud in Word is to select the Review tab > Read Aloud button. (a) you don’t have to highlight the text. Just position your cursor where you want the reading aloud to begin and click the Read Aloud button. And (b), when you click the Read Aloud button a second time, it stops. Click the button again to continue from that point on. So, essentially, you have a Pause feature with Read Aloud that is not available with Speak. The Speak preferences are defined in Widows, not in Word specifically. 2. 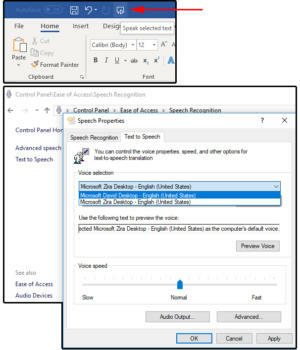 Select Ease of Access > Speech Recognition > Text to Speech, and the Speech Properties dialog window opens on the Text to Speech tab. 3. Under Voice Selection, choose MS David Desktop for a male voice or MS Zira Desktop for a female voice. 4. Click the Preview button to listen to each voice, then make your selection. 5. Use the slider under Voice Speed to adjust the pace (slow, normal, or fast) of the reader. 6. Click the Audio Output button to define the Sound preferences. 7. Click the Advanced button to select or change the output device. JD Sartain is a technology journalist from Boston. She writes the Max Productivity column for PCWorld, a monthly column for CIO, and regular feature articles for Network World.